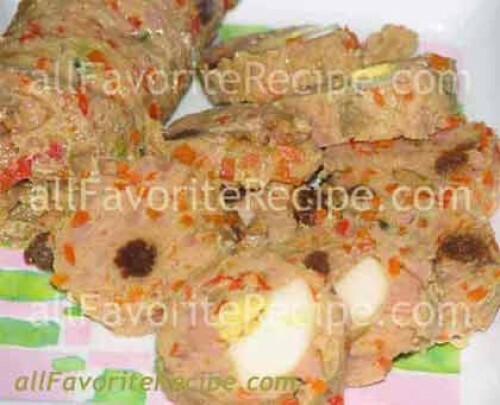 Embutido is a Filipino style of meatloaf. 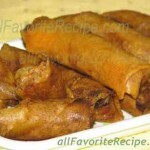 This filipino food dish is one of the favorite filipino dish that my hubby loves to eat. He even consumes the whole wrap of embutido in a single setting. My kids love also the embutido especially with the portion of hard-cooked eggs and sausages. They said that “embutido” means that it is wrapped with the skin of the pig’s intestines. But this embutido is just wrapped with an aluminum foil because my family especially my hubby doesn’t like to eat food that contains internal organs of the animals. Embutido can be served as cold cuts; lightly pan a sliced pieces or fried the whole then sliced. It is also best that you dip a slice of embutido with your favorite food sauce. As for me, my favorite is the sweet chili sauce while my kids love to dip it with ketchup. Hmm…delicious… Enjoy!!! We tried the recipe. It was very good. We did not have sweet ham – substituted hotdogs instead. Also, we will try using canned pimientos next time. Very good taste! Thanks for posting. I really want to learn to cook and by posting all your filipino food recipes, it gives me great help because sometimes I miss the food back home and now I can do it in my own kitchen here. I learned a lot from you and I really appreciate it. Dash of liquid seasoning is like Knorr seasoning or Maggie seasoning. It comes in a small dark bottle with a long pointed neck. Label is coloured green and yellow for Knorr, and yellow and red for Maggie. Hope this helps. one of my favorite dishes..i’ll try to do this recipe and will let you know the results. thanks a lot for sharing. thanks for posting this, i want to cook and follow your recipe but i dunno this “•dash of liquid seasoning”? This is for miss Gloria Torello. I f you don’t have steamer you can cook it in the oven too. I made 5 rolls in total, gave one to my father-in-law ( he called within minutes to tell my fiancee how wonderful it was) and I gave one to my mother-in-law (who owns her own filipino restaurant – she called quick, too). They said the taste, texture, and colour was just as it should be – as if it had been made in the Philipinnes! But I made this dish for the first time, here in Canada – and I’m pure Canadian. It made me very proud that I could do MY filipino family proud! Thanks so much for the recipe – it’s our new family favorite and will stay with us forever. I love this so much everytime I will go back to Philippines I request my family to have this & in any occassion….Thanks alot for this recipe …will try to do it by myself. I really love embutido. 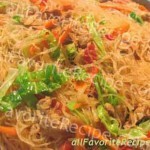 This is one of my favorite filipino recipe ever. Any celebration will no be complete without embutido. I don’t know how to cook… i only learned when i move to Australia to be with my husband. Thanks for this recipes that easy to follow. This is one Filipino dish I miss so much since moving to Europe! I’ll just have to make it myself. Thanks for the easy to follow recipe!